Are you feeling a little worn out by football and rugby? Feeling yourself tired of swinging that tennis racket or cricket bat? Looking for something a little more exciting and unconventional to sink your teeth into? Well, you are in luck. There are so many new sports and activities these days that you have got no shortage of options to choose from. But where should you start? Consider, for a moment, starting with this article, in which just a few choice new sports are laid out and explained for your convenience. If anything should take your fancy, you’ll have a good idea of the direction to take in your new sporting endeavor. Futsal is an interesting new sport, literally translating as “mini football.” It is similar to Great British football in many ways, except that it is played on a smaller, hard pitch, with a smaller ball and only five players to a side. So it truly is “mini” in almost every aspect. However, these alterations mean that a great deal more technicality can be obtained in the playstyle, with an emphasis placed in Futsal on creative, ingenious play, as well as improvisation and ball control. This then, would be perfect for anyone keen on Football but looking for a game with a little more individual player focus and an opportunity to really work on their footwork. 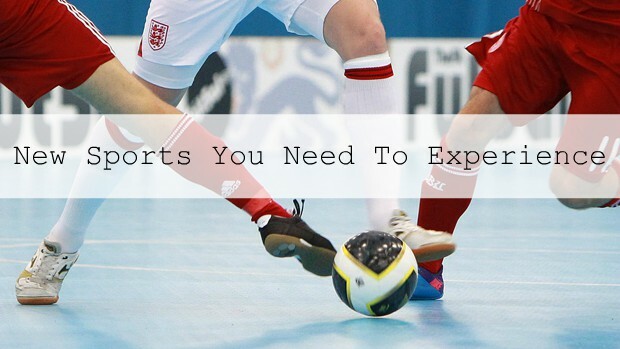 Futsal is becoming more and more popular every day, with societies cropping up at many universities. It’s also rapidly becoming a prevalent professional sport with proper championships and tournaments worldwide. So if this seems like something that would be up your street, have a look at your local sports centres to see what options are available to you. For the extreme sports enthusiast, stunt scootering is a new and exciting activity which is on the rise. The style is a mix of BMX and traditional skating, and offers the best of both these worlds while still bringing a little something of its own to the mix. One of the best things about stunt scootering is that the scooters used are highly customizable, meaning that you can chop and change your ride until you find an aesthetic that you’re really happy with. The Chilli Pro Scooter range, however, is ideal for the everyday rider looking for high-quality and technical reliability. They have many models available, all suiting different needs and capabilities; therefore, check out Skates.co.uk and find out which is better suited for you. Once you’ve found something that suits, you can head out to the skate parks and start practicing your skills. For the Harry Potter fan, this is a must try. Of course, there’s no real magic involving, and no flying, which may think could take some of the wonders out of the whole thing. However, Quidditch, the real-life game, more than makes up for this by being a riveting and tense game in its own right. The rules are exactly the same as you will have seen or read in the movies and books, while there are organizations devoted to the game that have been set up across the world. Grab a broom and dive straight in. So much yes to quidditch!! I'm going to have to check out Quidditch. I'm a huge Harry Potter fan. I don't think I'm going to get my hockey loving husband to put it aside though. Interesting! I have not heard of these. Well I know of Quidditch but did not know it was actually played in real life. I've never heard of these besides Qudditch from Harry Potter!